While I do love a good Metroidvania, it’s fair to say that the Nintendo Switch is now so riddled with the genre that it’s easy for the tedium to set in for even the most avid fan. Things are coming to the point where not only are we overwhelmingly spoilt for choice, we have seen so many absolute bangers on the hybrid system to last two generations. From Dead Cells, SteamWorld Dig 2 and The Messenger to Axiom Verge, Hollow Knight, Guacamelee! Super Turbo Championship Edition and its superb sequel, not to mention many, many more. For something to adopt this highly popular formula in this current window of the Nintendo Switch lifecycle, it really needs to bring with it something special indeed. If not, it will be more like a mediocre comedian trying to follow a Richard Pryor act. 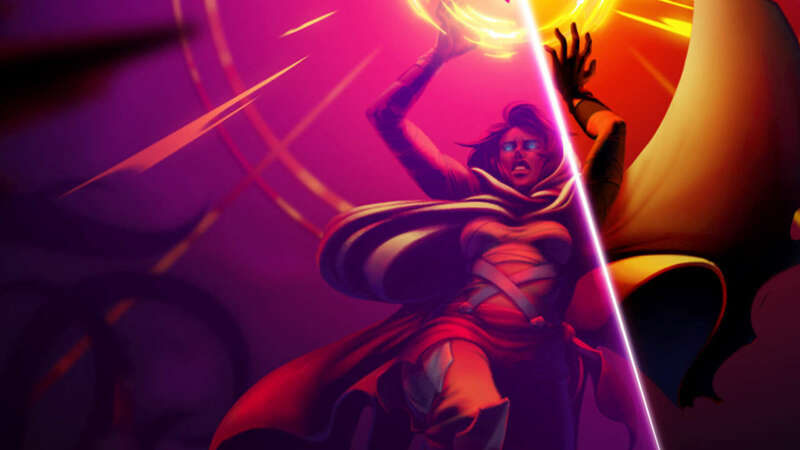 With that said, the biggest hurdle that Sundered: Eldritch Edition faces, is that, despite seeing a release date a full year before Dead Cells and The Messenger landed on Steam, the game seems to have come in third place when it comes to racing for exposure on Nintendo Switch. Yet, there is a lot that it does right outside its beautifully hand-drawn art style, Bayonetta-esque combat system and its spliced sci-fi Nordic lore. The problem is that I did initially find it a little harder to get into than I overall felt it deserved. This is mainly down to your character being thrown into a rather generic-looking research facility from the offset. The fact that the rooms are procedurally generated doesn’t really help the matter, either. It starts off a bit bland and all too familiar for the first couple of hours, as you crawl your way through a Metroid-style map system finding certain rooms to unlock new pathways. The early horde of enemies being mechanical war machines also gave me a sense of tiredness in their design. However, once I began to venture further into its dark and unforgiving world, not only does it become more attractive to the eye, it begins to set itself up closer towards the category of a tense survival horror. The reward for pushing onwards lies within the enemy design. The alloys that make up early enemies are either replaced or fused with the fluid movement of tentacles attached to hollow beings that whip and clap. Enemies rarely approach you alone. Instead, they charge at you in sprawling armies like a perverse mashup of Pitch Black and 28 Days Later. Bosses are even more of a spectacle to look at with such a wonderful hand-drawn art style that sees them become an absolute highlight in imaginative design. You can clearly tell this is a Thunder Lotus game, for its distinction in motion reflect the fluid frames of animation found in Jotun: Valhalla Edition. The challenge in Sundered: Eldritch Edition can be quite intimidating even in the standard difficulty. The idea is that death is not in vain for all that you earn can be spent on the branches of a vast skill tree to beef up your character further. You don’t lose anything when you die either, unlike the typical blueprint of a rogue-like adventure. The pros of a gameplay element like this does mean that the game does cater well enough for shorter blasts. The show-all map system also ensures that you’re never really wandering around aimlessly without an objective. Unfortunately, despite finding myself clicking with pockets of addictiveness with a character so tight in movement and combat, I still couldn’t shake off the underwhelming feeling that I’ve done it all before, just better. Load times and backtracking to your death point becomes tiresome, especially because the props that make up the level design become all too repetitive. I would love to have seen the personality of the environments match that of the character design. Instead, it just comes across quite safe and a little soulless. In any case, there is still plenty of atmosphere here to accompany the game’s visual high points. The audio itself concentrates more on the sounds of horror as opposed to a dramatic musical beat. The sound of hacking your way through a demonic horde in the midst of haunting shrieks doesn’t half work nicely when embraced with a pair of headphones. With this version being the Eldritch Edition, there’s also a newly added four player local co-op mode to put those spare Joy-Con to good use. Surprisingly, despite being a tacked on afterthought, the nature of the ridged level design and decent hack ‘n’ slash combat system makes the multiplayer experience much more practical than something like Guacamelee! Super Turbo Championship Edition. If anything, it’s actually probably the closest your currently going to get to a multiplayer Dead Cells experience.